I finished that white sketchbook on New Year's Eve! Two years in a row, finishing sketchbooks minutes before midnight, and I don't even care for New Year. Big New Year cynic. Maybe this is a pattern for improvement. Here's some sketches from the last of that sketchbook. 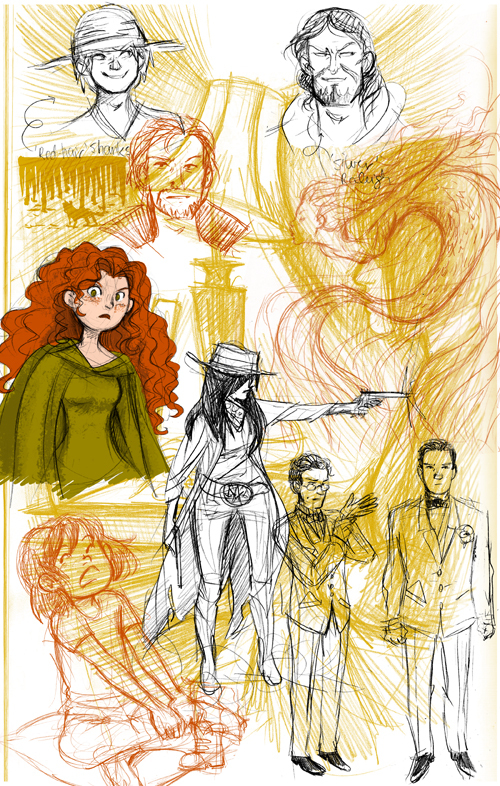 The lower half are characters I made up, the upper half is mostly One Piece, plus a Merida (Brave. Drawing her is incredibly fun). Random bits. That mermaid sketch is the precursor to a painting I made for my friend. So what's on the plate now? I signed up for the Sketchbook Project. I'll post photos of that later. I've got to do some serious documenting for this sketchbook, since I'll be relinquishing to the mercy of a traveling sketchbook library and probably won't see it again.